At the Hawkesbury General Hospital on Saturday, May 26, 2018. 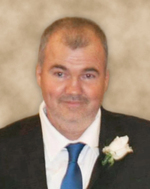 David Duncan MacPherson of Grenville, Quebec, formerly of Dalkeith; age 52 years. Beloved husband of Suzye MacPherson (nee Joly). Loving father of Jonathan (Amber) of Ottawa, Max (Kristin MacNaughton) of St. Eugene, and Alex (Kristina Waugh) of Lachute. Cherished grandfather of Daphnée, Avery, Anabelle, Kassandra and Savannah. Dear brother of the late Arnold (late Alexina), Donald (Susan), Ruth Curran (Drummond), the late Jean Hambleton (Lloyd), Keith (Elaine), Gary (Cindy), Sandy, Helen Lavigne (late Wilfred), Alan (late Danielle), and Mavis MacPherson. Predeceased by his parents Vincent and Kathleen MacPherson (nee Burton). He will be missed by his beloved dogs Bella, Daisy and Skye. Relatives and friends may call at the Munro & Morris Funeral Homes Ltd., 114 Main St. South, Alexandria (613-525-2772) on Wednesday, May 30, 2018 from 2-4 pm and 7-9 pm and on Thursday from 9am -10 am. A Mass of Christian Burial will be celebrated at St. Finnan's Cathedral, Alexandria on Thursday, May 31, 2018 at 10:30 am. Cremation will follow. As expressions of sympathy Memorial Donations to the Heart & Stroke Foundation of Ontario would be appreciated by the family. As a Memorial to David a tree will be planted in a Memory Woods.